Stream & Save our August Playlist! 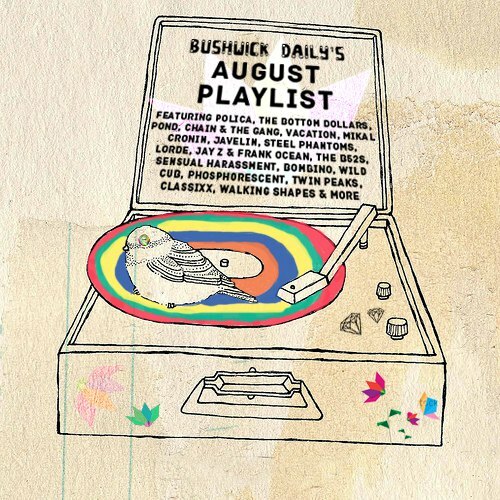 The music writers of Bushwick Daily thought long and hard about the best songs to inspire a vibrant end of summer. We joined forced to bring you an eclectic mix of songs that you can listen to on your commute or at a party, featuring jams new and old, from punk to r&b, sugary pop to dance-floor wicked. Here it is in its glory, for you to stream and save to your Spotify playlists. We're featuring everyone from Pictureplane to Twin Peaks, Camera Obscura to Frank Ocean, and a whole lot more ear goodies.